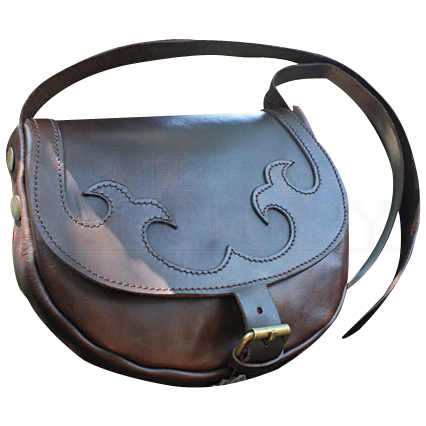 Keep your essentials by your side at your historic reenactment events, LARP gatherings, or everyday travels with our Leather Shoulder Bag. Handmade from natural cowhide leather, this stylish bag features a fold over lid design. Sewn onto the edge of the bags lid is a simple yet stylish medieval fleur embellishment, constructed from an added panel of leather, for just enough flair to help you stand out while keeping your overall appearance authentic. The lid is fastened down to the body of the bag by a buckle and strap fixture. Available in both dark brown and black, this medieval shoulder bag is a must-have for those moments when a belt bag is not enough.